Posted on May 19, 2017 by Amanda C.
When you travel, there are lots of little ways that tell you that you are far from home. It doesn’t even take a house falling on your head to give you a heads up, but sometimes, that helps. I am traveling solo for a roller derby clinic and thrilling in the ability to just explore. It’s novel. Wait, I don’t have to ask a certain pre-schooler if she has to go potty before we leave the hotel? WHAAAT? Today, I plan to walk my feet off. I intentionally arrived early so that I could just visit a new place. Yep. Utah is a new place, y’all. After leaving Georgia, I think I started taking for granted the fact that other states actually sell alcohol on Sundays. And anywhere outside of Boulder, lighting a cigarette on the street is normal. 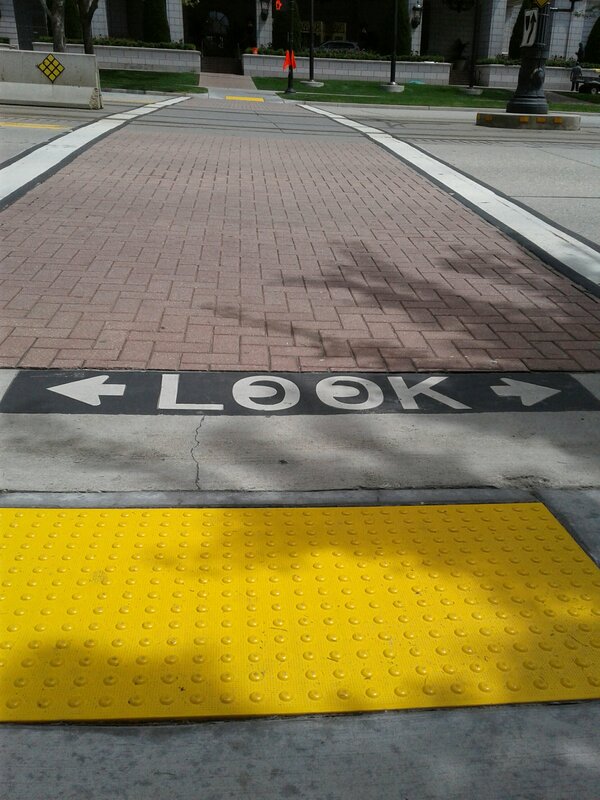 Here in Salt Lake City, the way I’m going to have to at least temporarily reset my expectations is in how I cross the street. One way streets are no big deal, I can handle those. But Salt Lake seems to actually have a functioning and accessible light rail system running through it’s heart. As such, even the road implores you to check for traffic. My light rail conductor even slowed down the train to open her window and holler at some folks walking along the median between the two sets of tracks to get out of there. She reminded them that apparently it IS rocket science to safely cross the street. And then we passed this billboard. No joke. Art imitates life? Or the other way around? I feel like the 1920s image of hopping on and off trolley cars is not a nostalgia that they hold truck with here. Maybe it was a one-time thing and not a Utah thing, but I like to think of it as a local color observation. Let’s go explore some more, hmm? Mountains on the east…not on the west…got it. Posted in life ehgo and tagged belly button gazing, local color, SLC, travel. Bookmark the permalink. Posting pictures of the bathroom did not happen this weekend. We had a house guest, a potential dog for adoption. She didn’t work out. However, I’ve been giving some thought to starting a new Day Zero list focusing on Colorado. I live here now (3+ years actually) and I’d like to do more toward feeling like I have a greater connection to my new home state. I want to take a deliberate and intentional approach to things and not look back in 20 years or so and think of all the things I haven’t done. That’s a little too deep. I’d also like to do more blog posts of substance, but maybe tomorrow. I’m getting old again next Sunday. Our neighbor across the street died Friday night. It has taken me all weekend to be affected by his death. We made banana nut muffins for his widow this morning and when out running errands today I found myself just driving aimlessly. John was a very kind man, a veteran and a cancer survivor. I don’t have anything else to say. Posted in life ehgo and tagged banana nut muffins, belly button gazing, day zero. Bookmark the permalink.